Every parent is responsible for making sure their children learn some basic, but extremely important life skills. The other day, I read that an adult female escaped two male thugs (who had forced her at gunpoint to drive her vehicle around town) by knowing how to drive stick. Apparently the suspects only drove automatics. I know comparing this to teaching a kid to ride a bike is pretty extreme, but hey, you never know when being able to flee on a bike may come in handy. Biking in general opens up a whole new world for people needing to get around, and it happens to also be environmentally friendly. Kids love bikes, but for some parents, the cost of a bike can be a barrier to teaching their children how to ride. My daughter is 5.5 years-old. She's quite tall for her age, on par with some seven year-old girls. For her 4th birthday, Grandpa bought her a bike from Walmart. She got on it a few times, training wheels and all, but wasn't addicted to it per se. I think it was because the pedals were so hard to push and she was too tall for it even with the seat raised to the top. The Walmart bike was basically left to the spiders and bugs to make into a home. Many people probably turn to Walmart to get their kids a starter bike. Their prices on new bikes are hard to beat. A 20'' pink Huffy will set you back only $49.97. Amazon may be an option for adults with mechanical aptitude who have the patience to put a bike together. A 16'' boys steel frame costs $54.99 with free shipping. Where else can people turn to get their kids a bike? The Play-It-Again and other discount (sort-of) retail stores like Sports Authority are closing down all over the country thanks to the behemoth that is Amazon. Saving money every month until Christmas rolls around or until your child has a birthday is also a sensible thing to do financially. My daughter's bike training was at a standstill this summer. Again I encouraged her to try riding the Walmart bike, but she was too scared to try without the training wheels (I'd removed them). Then we took a vacation to Northern CA in July. 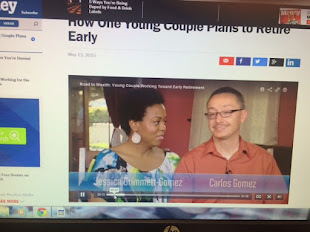 I met up with a former colleague at her million dollar home in Santa Clara, CA. My two kids and her two kids spent an evening playing with toys, as she and I caught up. Just as we (my wife was with me) were leaving, I asked my friend's husband (a Silicon Valley engineer) if he was still road cycling. This conversation would end with my children getting two free "Specialized" brand used bikes. One was actually a balance bike, the type kids use to learn the skill of bicycle balancing by striding along or by rolling down hill. His two boys had grown out of them. This lucky break and kind gesture re-energized my daughter. She loved the balance bike! 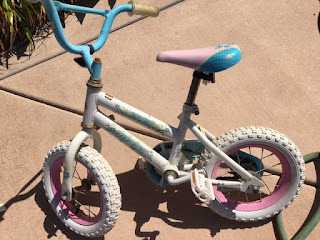 Once home in Oceanside, she started asking me to take her outside with her "pirate" bike. There is a sticker of a pirate on the balance bike. She first used it to stride along as we went on walks around the neighborhood. Then she gathered the nerve to launch herself and balance rolling down driveways. I had to be the car lookout and clear her to go. She mastered balancing in about four outings. It was time for her to try pedaling and balancing. 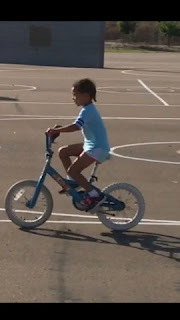 I drove her to the local elementary and on the basketball blacktop, I gave her some words of encouragement, held the back of her seat, and told her to pedal. She wasn't as scared because she knew that if she needed to, she could always put her foot down (she was too tall for this bike as well). After a few attempts with me holding on and letting go, she was able to ride solo! She'd done it. Riding the bike! Proud father moment. But the true test was riding a bike her size. I turned to Craigslist. As a bike expert I was sure to find her a name brand bike, her size, hopefully at a decent prize. I got lucky. I found a girl's Diamondback being sold in Carlsbad, CA for only $25! It was a steal and I wasn't going to let anyone else beat me to it. Within the hour I was at the home of the seller and had purchased this used girl's bike; it was in great condition. There are deals on Craigslist folks! Especially if you are great at spotting undervalued/priced items. A couple days later we were back at the elementary. The bigger girl's bike was in the back of the SUV. I took it out. I could sense my daughter's nervousness. I reassured her, telling her she already knew how to ride a bike and that she was simply going to be doing it on a bike her size. I helped her get on the seat, told her to pedal, and let her go. $25 for a bike my daughter's size. Seeing my daughter riding a bike for the first time...priceless.